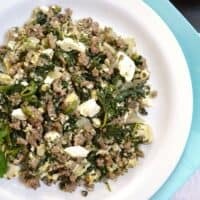 Joe's special - a hearty ground beef and egg dish featuring spinach, parmesan cheese, and savory herbs. Mince the garlic and dice the onion. Cook both in skillet with olive oil over medium heat until soft and transparent (about 5 minutes). Add the ground beef, oregano, salt, and worcestershire sauce. Cook until the beef is no longer pink, breaking it up into pieces as it cooks (7-10 minutes). Once the beef is fully cooked, add the frozen spinach. Cook and stir until it has thawed and heated through, breaking up clumps as you go. Briefly whisk 6 eggs in a bowl. Push the beef and spinach mixture to one side of the skillet (or make a well in the center) and pour in the eggs. Gently scramble the eggs until they are cooked through, but still moist. Try not to mix them into the meat as they cook or you’ll have beef coated in egg, rather than clumps of cooked egg. Once the egg is cooked, stir it into the beef mixture and turn off the burner. Crumble or roughly chop the feta cheese and sprinkle it over the skillet. Also sprinkle with grated parmesan cheese. Stir to combine, taste, adjust the salt if needed, and then serve.